Ferries go from Lausanne in Switzerland to Thonon and Evian in France while pleasure boats cruise on Lac Léman to Genève, Nyon, Vevey, Montreux, and other Swiss towns on Lake Geneva. Lausanne is an important departure port for boats cruising on Lake Geneva (Lac Léman) between Switzerland and France. Passenger ferry boat services connect Lausanne with the French cities Evian and Thonon-les-Bains. Pleasure boat cruises depart from Lausanne on day excursions to all parts of Lake Geneva including Genève, Nyon, Morges, Yvoire, Vevey, Montreux, Chateau de Chillon, and St Gingolph. Savings deals and cheaper offers are available to reduce ticket prices which are often far from cheap. Dinner and lunch cruises are available (with fondue cruises popular in winter, autumn, and spring). 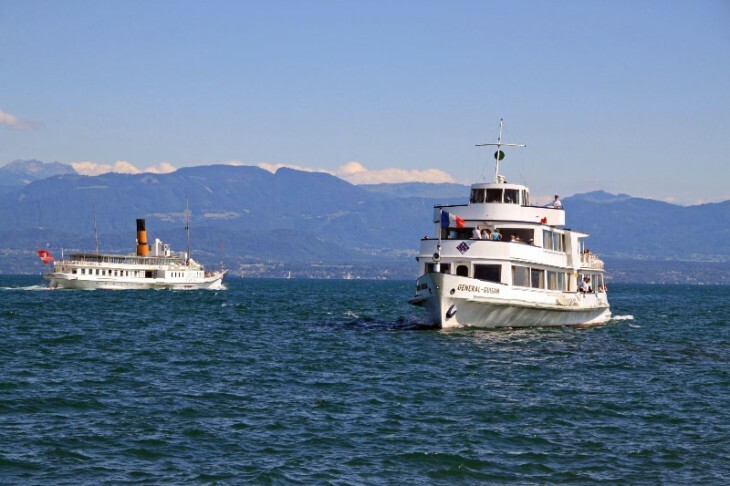 Ferries, pleasure boats, and historic paddle steamers from Lausanne are operated by the Compagnie Générale de Navigation sur le Lac Léman (CGN). Lausanne is not only a popular departure point for boat cruises but also located where the Alpine backdrop over Lake Geneva is at its most beautiful. Lausanne is the Swiss port for passenger ferries to the French towns Thonon-les-Bains and Evian-les-Bains on the southern shores of Lake Geneva (Lac Léman). These ferries carry only passengers and bicycles – no car ferries operate on Lake Geneva. The two ferry routes from Lausanne are officially known as CGN Mobilité routes N1 (Lausanne-Evian) and N2 (Lausanne-Thonon). Just fewer than 30 crossings of Lake Geneva are made each day per route. The Lausanne-Evian ferry crosses Lake Geneva in 35 minutes. The return fare is around CHF36 (CHF51 in first class). The Lausanne-Thonon ferry crosses Lake Geneva in between 27 and 50 minutes. The return fare is CHF48 (CHF68 in first class). This route does not always operate on weekends during the low season. The ferries from Lausanne to Evian and Thonon are aimed at commuters and thus operate year round, although sailings are fewer during winter. The first boats of the day depart for Evian around 5 am and the last ones around 11 pm (hours on the Thonon route are a bit shorter). Lausanne is a popular departure point for Lake Geneva excursion boat cruises and day trips with many daily departures during summer. During the shoulder season, often only a few boats depart per day while winter cruises are often limited to weekends. The Beautiful Panoramic Cruise connects Lausanne and Geneva twice per day in just less than four hours. The boats stop in many Swiss town en route (including Nyon, Rolle, and Morges) as well as in France (usually Yvoire). The Famous Lemanic Vineyards Cruise sails three times per day from Lausanne via Vevey and the UNESCO World Cultural Heritage-listed vineyards of Lavaux to Montreux in around 90 minutes. En route, the boats usually call at Pully, Lutry, Cully and Vevey. The Chillon Castle Cruise is a round-trip cruise from Lausanne via Chillon, the most popular medieval castle in Switzerland. This cruise goes up to four times per day from Lausanne to St Gingolph, Le Bouvet, and Villeneuve before arriving at Chateau de Chillon. The return is via Montreux, Vevey and the Lavaux vineyards. Many further pleasure boats go from Lausanne to Vevey, Montreux, and Chillon with further connections available from especially Vevey. This area of Lake Geneva, known as the Haut-Lac, has the most spectacular Alpine backdrops to the south and the Lavaux vineyards on the north shore. Lake Geneva boat cruises are often not cheap but many discount offers are available to bring ticket prices down. It is often worth paying extra for first class, as second class passengers do not have access to open upper decks. Boats often slow down during meal times but buying food on board is not compulsory. During summer, historic paddle steamers from the pre-World War belle époque era are used on many routes but do not require any surcharges. The Daily Card (La Carte Journalière / Evasion) is CHF64 (CHF90 in first class) and valid for unlimited travel for a day on all CGN boats. On longer routes, e.g. Lausanne-Geneva return, the daily card is automatically offered as it is the cheaper option. Family passes are also available in a variety of combinations. Children without a Junior Card can buy a Kid’s Pass for CHF10 (CHF20 in first class) for the day.